My Menagerie | From the Seasonally Occupied Territories . . .
Daddy duck in a favorite pose. Mama duck is roosting in the pet carrier below. For ten days or so I’m looking after a neighbor’s dog. Along with the dog come two handsome ginger cats, four hens, and two ducks, the female of whom is sitting on an egg. The ducks are a recent acquisition. My neighbors don’t know exactly how long mama duck has been sitting on the egg. The egg may, in other words, hatch while they’re gone. Fortunately my neighbors are of the que sera, sera variety. They don’t know what mama will do if/when the duckling appears, or how the resident hens will react. The resident hens are apparently beyond their egg-laying years. Mr. 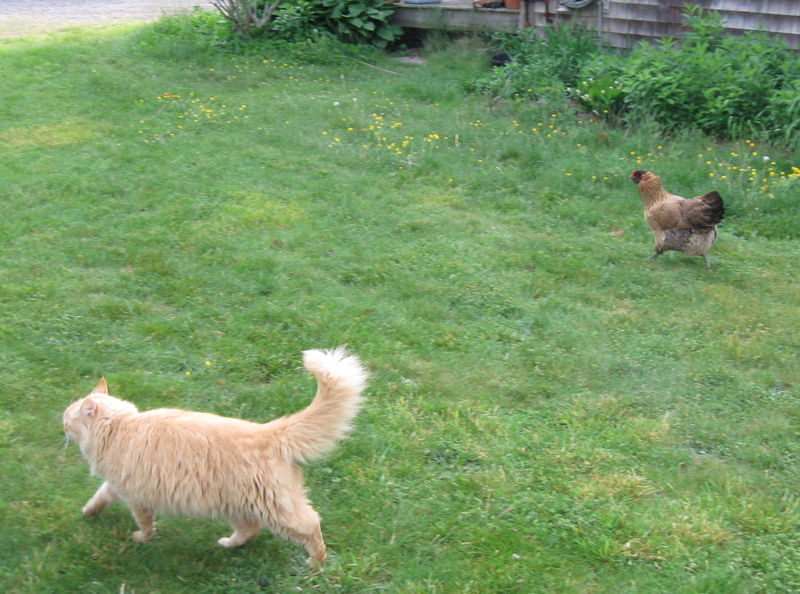 Neighbor has allowed as how he wouldn’t mind terribly if Travvy dispatched one or more to Hen Heaven. I have not told Travvy that. The ducks, Ms. Neighbor told me, really like bread. Since I was away last weekend and I baked today, I had a thick past-its-prime (but still edible) crust left over from my last loaf. When I went to feed T-Beau (whose name is also spelled Thibeaux, Tebo, and a few other ways) the dog, I tore it into chunks and added it to the two pans of cracked corn left out for the fowl. The hens were chowing down when I left. Maybe the ducks will get some too. Maybe not. 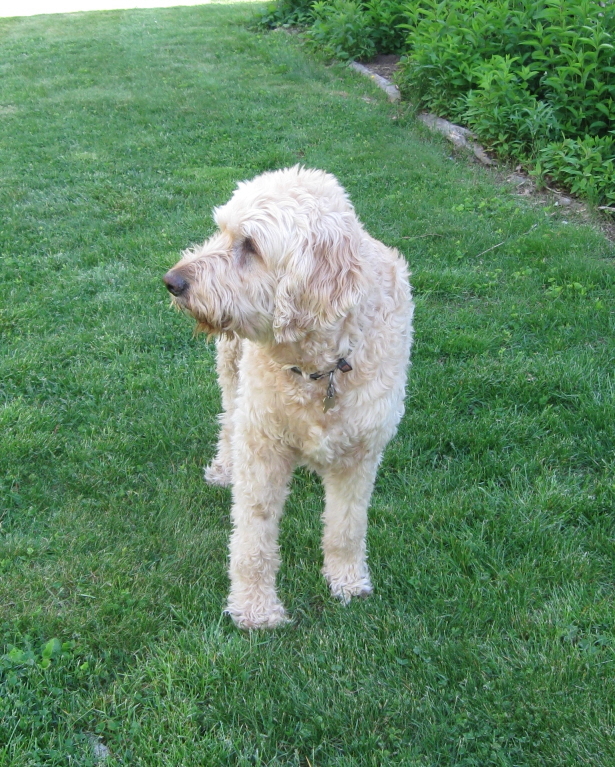 T-Beau is a goldendoodle, a big, sweet, goofy guy. He’s a little leery of Trav, but they get along fine, so I’ve been taking T-Beau on some of our walks. T-Beau is 10 and slowing down somewhat. Travvy is 4 and “slowing down” isn’t on his horizon yet. When he plays zoomies on his Flexi lead, I’m hard pressed to keep the lead from wrapping around T-Beau. We take shorter, somewhat less brisk walks when T-Beau comes along. Since the neighbors’ house isn’t far away, I can drop by sans Trav and spend some quality time with the big guy. The two cats are golden too. When Trav and I walk, drive, or bike by, they like to sit in the middle of the dirt road and think, I’m here, you’re on a leash, nyah nyah nyah. The big cat is Cricket. The smaller one is Love-Bug. I haven’t told Trav that I’m looking after Those Cats, but I think he smells cat on my clothes when I come home. T-Beau, Love-Bug, Cricket, the (nameless) hens, and the (also nameless) ducks live in an idyllic Peaceable Kingdom. Throw Trav into the mix and you’d have something like the twister that whirled Dorothy off to Oz. Sometimes I wish I had a dog that was into laid-back coexistence with other species. Most of the time I’m glad I have Trav. He keeps me on my toes. Speaking of toes — there’s no way I’d walk around here barefoot. Free-range chickens don’t clean up after themselves, and no one is following after them with pooper-scoopers. Having encountered these chickens on the road, where they seem oblivious to the fact that only a thin strip of webbing separates them from a salivating malamute, I knew they were bold. I was warned that they’ll come into the house if you let them. One afternoon I arrived to find that the front door had blown open. 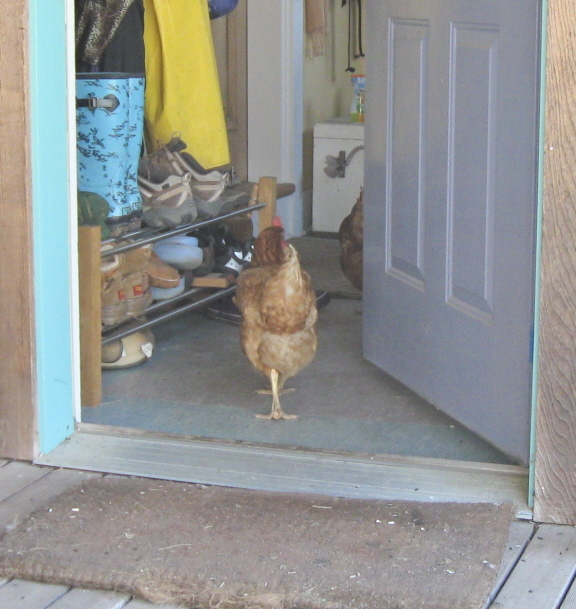 I searched the house diligently to make sure that no hen had taken up residence in a human’s bedroom. Whenever I take on a new animal-sitting gig, the first 24 hours are the most nerve-racking. What didn’t the humans tell me? What if I show up in the morning and everyone’s dead? I was much relieved last Friday evening when I discovered that yes, indeed, the hens had gathered themselves into the coop as sundown approached. Just as Ms. Neighbor said they would. I opened the side door and counted: one, two, three, four. Whew. True, I’m still a little anxious about that duck egg, but hey, que sera, sera, right? I can’t control the neighborhood’s skunks and raccoons. May 21, before 7 a.m. The egg hatched last night. There’s now a fuzzy yellow little duckling in the pet carrier with mama. Mama came out of the carrier to eat some of the cracked corn I put down this morning — the first time I’ve seen her out of her little cave. Papa duck is overhead being vigilant. It sounds like he’s hyperventilating, but these may be his Keep away! noises. The hens were eating the cracked corn in the coop (where mama, baby, and the pet carrier are — it’s maybe four by five feet, not very big) and paying no apparent attention to the new arrival. T-Beau, on the other side of the chickenwire enclosure, was most interested. Both cats were inside the house eating at the time. 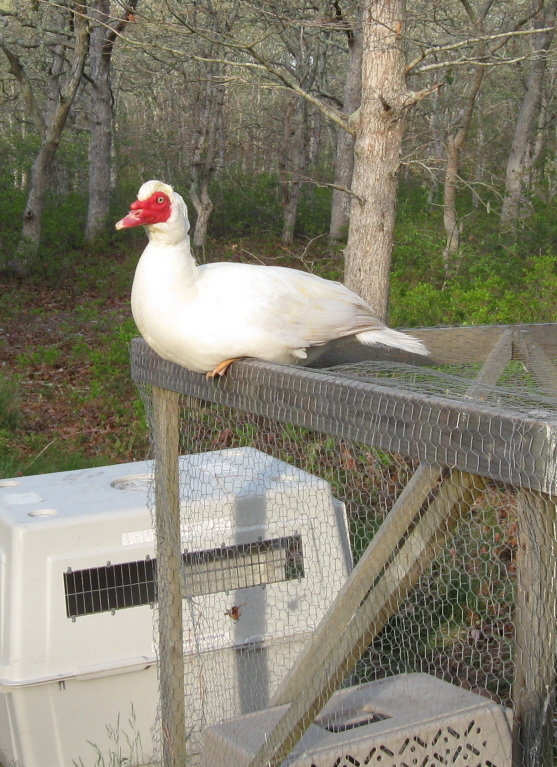 This entry was posted in dogs, Martha's Vineyard, work and tagged anxiety, cats, chickens, dogs, ducks, Travvy. Bookmark the permalink. You’re the neighbor everyone would like to have. A question. Why do you choose to use nerve-racking, and not nerve-wracking? Inquiring mind wants to know. Because the nerves are being tortured by a device beloved of the Inquisition, aka a rack. Both “nerve-racking” and “nerve-wracking” are given in Merriam-Webster’s Collegiate Dictionary, 11th ed. (known to editors as “Web 11” or “MW11”), with the former listed first. Since “wrack” and “wreck” are closely related, “wrack” seems to be a variant of “rack,” and “wrack” and “rack” are pronounced identically, it’s not hard to see/hear why they’ve become pretty much interchangeable.